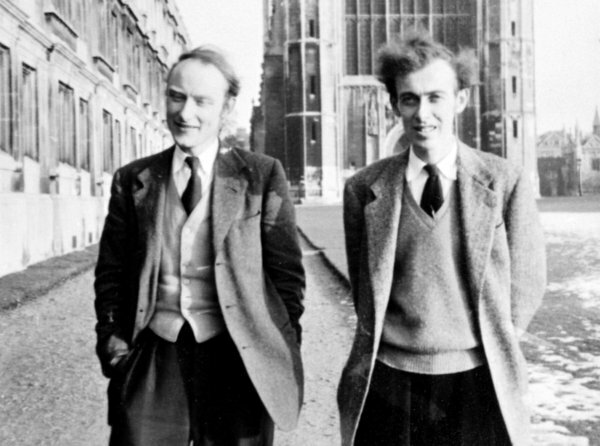 Francis Crick and James Watson, walking along the Backs, Cambridge, England. 1953. Today, our series on models of DNA is concluded with a discussion of the correct structure determined by James Watson and Francis Crick. Although they made an unlikely pair, the two men succeeded where one of the era’s leading scientists – Linus Pauling – failed, and in the process they unraveled the secrets of what may be the most important molecule in human history. The pair’s first attempt at the structure in the fall of 1951 was very quick, and also unsuccessful. Interestingly, however, it was quite similar to Linus Pauling and Robert Corey‘s own attempt about a year later. Watson and Crick came up with a three stranded helix, with the base rings located on the outside of the molecule and the phosphate groups found on the inside. This left them with the problem of fitting so many negatively charged phosphates into the core without the molecule blowing itself apart. In order to solve this problem, they turned to Pauling’s own The Nature of the Chemical Bond. They were looking for positive ions that would fit into the core of DNA, therefore canceling the negative charge. They found magnesium and calcium to be possibilities, but there was no significant evidence that these ions were in DNA. However, there was no evidence against it either, so they ran with the idea. Watson and Crick assumed – as would Pauling in his later attempt – that the finer details would fall into place. Overjoyed at solving DNA so quickly, they invited Wilkins and his assistant, Rosalind Franklin, to have a look at their structure. Expecting praise, they were undoubtedly surprised when Franklin verbally destroyed their work. She told them that any positive ions found in the core would be surrounded by water, which would render them neutral and unable to cancel out the negative phosphate charges. She also noted that DNA soaks up a large amount of water, which indicates that the phosphate groups are on the outside of the molecule. All in all, Franklin had no positive feedback for Watson and Crick. And she was, at it turned out, correct. After the visit, Watson and Crick attempted to persuade Wilkins and Franklin to collaborate with them on another attempt at the structure of DNA, but their offer was declined. Diagram of the double-helix structure of DNA. August 1968. When Sir William Lawrence Bragg, the head of the Cavendish laboratory, heard about Watson and Crick’s failure, he quickly sent them back to other projects. Almost a year passed with Watson and Crick accomplishing no significant work on DNA. Although they weren’t building models, DNA was still at the front of their minds and they were gathering information at every opportunity. In the fall of 1952, Peter Pauling, the second eldest of Linus and Ava Helen Pauling’s four children, arrived at Cambridge to work as a graduate student. Jerry Donohue, another colleague of Pauling’s from Caltech, also arrived at the same time and was assigned to share an office with Watson and Crick. As a result, Peter also fell in with the group. Therefore, as the quest for DNA progressed, Linus Pauling was provided with a general idea of Watson and Crick’s work with DNA through contact with Peter. However, the opposite also proved true. When Pauling and Corey submitted their manuscript on the structure of DNA in the last few days of 1952, Peter passed on to Watson and Crick the news that his father had solved DNA. Although the two men were crestfallen by this information, they decided to soldier on with their own program of research, figuring that if they published something at the same time Pauling that did, they might at least be able to share some of the credit. Around this time, the pair added an important piece of information that they had learned from Erwin Chargaff, a biochemist. He had told them that the four different base rings in DNA appeared to be found in pairs. That is, one base ring is found in the same relative amounts as another. This first correlation constitutes one pair, and the remaining two bases make up the other pair. Interestingly enough, Chargaff had also told Pauling this same thing in 1947. However, Pauling had found him to be annoying and, as a result, disregarded his tip. Chargaff’s information did, however, prove to be crucial for Watson and Crick, who were slowly piecing together the basics of the DNA structure. When Watson and Crick finally received Pauling’s manuscript via Peter in early-February 1953, they were surprised – not to mention elated – to see a structure very similar to their own first attempt. Bragg, a long time competitor of Pauling’s, was so pleased to see Pauling’s unsatisfactory work that he allowed Watson and Crick to return to DNA full time. The pair wasted no time, and had soon spread the news about Pauling’s model to all of Cambridge. Watson even told Wilkins about the manuscript, and was rewarded with the permission to view Franklin’s most recent DNA x-ray patterns. These beautifully-clear photos immediately confirmed Watson’s suspicion that DNA was a helix, adding yet another piece of important information. Based on all of the information that they had gathered, Watson and Crick began rapidly building models. One model, which Watson called “a very pretty model,” contained the wrong structures for two base rings. Fortunately, Donohue, who was an excellent structural chemist, set them right. After his correction, Watson and Crick noticed that hydrogen bonds would form naturally between the base pairs. This explained Chargaff’s findings, and also showed the potential for replication of the molecule. The rest of the model came together quickly, and Watson and Crick began to write up their structure. Eventually, Linus Pauling began to catch wind of the recent work that Watson and Crick had been doing with DNA. His first actual glimpse of their work came in March 1953 when Watson sent a letter to Max Delbrück, a colleague of Pauling’s, that included a brief description and rough sketches of the structure. Although Watson had asked Delbrück not to show the letter to Pauling, Delbrück could not resist. Pauling marveled at the simplicity and functionality of the structure, but still retained confidence in his own structure. Only a few days later, Pauling received an advance copy of the Watson and Crick manuscript, but he was still not convinced they had solved DNA. In April, Pauling finally traveled to England, and only after seeing the model in person and comparing it to Franklin’s DNA photographs was he certain that Watson and Crick had solved the structure of DNA. On April 25, 1953, Watson and Crick’s article, “A Structure for DNA” was published in Nature. James Watson, Francis Crick, and Maurice Wilkins would go on to share the Nobel Prize in Physiology or Medicine for 1962 “for their discoveries concerning the molecular structure of nucleic acids and its significance for information transfer in living material.” Unfortunately, Rosalind Franklin died of cancer at age 37 and, for many years, was given only minor credit for her considerable contributions related to the discovery of the DNA structure. For more information on Watson and Crick and DNA, please visit the website Linus Pauling and the Race for DNA: A Documentary History. For more information on Linus Pauling and his research, visit the Linus Pauling Online Portal. hey I’ve noticed that in a lot of your articles, if not all, u call Rosalind Franklin Maurice’s assistant when in fact: that is not the case at all! Rosalind Franklin very much contributed to these fool’s success. They stole her work and her photos of DNA and used them without a single mention of her in their “victory speech.” Except when she was falsely portrayed in James Watson’s book. She was their foundation and probably the most swindled woman scientist in history! Stop portraying her as some useless woman assistant when she was the one that deserved their rewards! It annoys me to no end when people don’t recognize the ones that deserve the credit! Attention: my model radically differs from a well-known Side by Side model.